Poker shows seem to be popping up everywhere now, and G4 is following suit. The show 2Months2Million is starting to air. 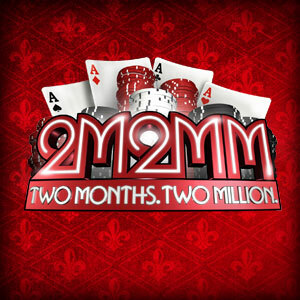 The concept of this show is to combine four online professionals, using their own bankroll, to win/earn $2 million playing online poker. What makes this show interesting are the adventures that these young pros go on in Las Vegas. Also, their are humiliations the players must perform for having the low winnings or high loss for the week. You will see other big online names guest star on the show such as Tom Dwan and Peter Galfond. Here are the players featured on the show. Jay received his degree for Screenwriting in college a few years ago. Jay has been playing the game since he was 12 years old, and when he turned 17 he would often sneak into Atlantic City to go play 5/10 limit. After completing at Boston College, Jay decided to pursue poker full time and became one of the best fast. Still, Jay’s dream is to write despite his success in poker. Brian has been playing poker for about 7 years now. After dropping out of school when he was a sophomore, Brain picked up the game about a year later. Going to his local casino, he won $100 and decided that this was what he was going to do for the rest of his life. It wasn’t much longer until Brian became one of the best players online. Ironically, Brian has never been great with adept mathematical theories, but plays a mathematical game. Emil didn’t start playing poker until his second year at NYU. His first game started inside the dorms, and everything after that is hearsay. Taking on the game quickly, Emil decided he wanted to play poker for one reason, he hates the 9-5 grind. After finding instant success, he hit a low point in his career losing over $1 million over the year. Emil’s life goal is to either own a MLB team or to be the GM of a MLB team. Dani is the youngest in the group, but just equally as accomplished. Dani played sports throughout his high school life and never liked any card game, except for Texas Hold’em. Even in Dani’s young poker career, he has already gone through some of the harshest swings in one session. His first $100,000 win was soon followed by $100,000 loss. Dani’s success can be credited by his ultra competitive nature.